Road markings play an important role in defining the layout of our roads, indicating everything from the areas we can’t park on to when we need to slow down. They are a vital feature on our roads, but naturally, they have to endure a lot of traffic and footfall going over them. As a result, road markings can begin to deteriorate and become less visible. Equally, road layouts can change and road markings can need to be changed accordingly. The problem with this is that road markings are designed to be permanent, and anything permanent is difficult to remove. Knowing how to remove road markings in the best and most efficient way helps to achieve a clean result fast, and also prevent damage to the road. Without the right approach, the result can be a damaged road that is no longer safe or easy to travel on, and this can require expensive solutions that can take a long time to resolve. Traditionally, road markings are removed by burning. The problem with this is that it produces toxic fumes that are dangerous to breath in. Additionally, this method can damage the road surface, which then requires extra work and maintenance to correct. The icing on the top of this inefficient cake is that sometimes this process doesn’t even work, meaning that the road markings are still stuck on the road. However, there is a much more effective approach to line marking removal, which we utilise here at Hydroblast. 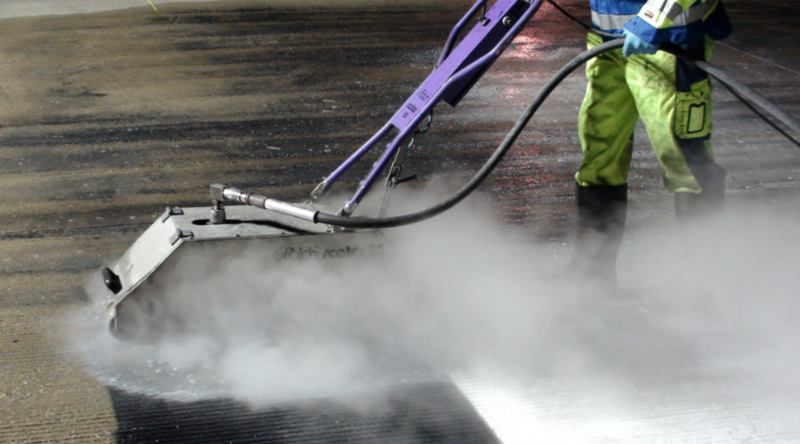 With the use of high-pressure water jets that are expertly controlled by fully qualified technicians, our team know how to remove road markings safely and efficiently. No matter the colour of road markings, our expert machines are able to propel water jets backwards and forwards to remove all line markings. There are some key advantages to this method of line marking removal, such as the fact that no harsh chemicals or abrasives are required to do the removal. Instead, the water jets remove road markings quicker than alternative abrasive methods, ensuring that there is no damage to the road itself. This process also prevents unwanted damage to the environment as no debris, smoke, or fumes are produced. This therefore cuts down toxic pollution to the surrounding area. Furthermore, it’s important to mention the efficiency of using water jets for road marking removal. This approach means that lines can be removed swiftly and roads can be finished and ready for use as quickly as possible. 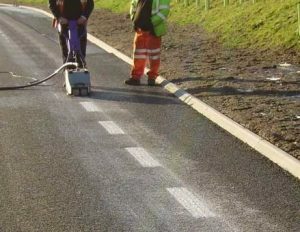 Efficiency in a road marking removal method is crucial to reduce the down-time of a road and to ensure the safety of users to reduce time without markings. Despite the permanent nature of road markings, we have plenty of experience in removing road markings. Take a look at our previous case study, where we efficiently removed yellow keep clear markings in front of a school. If you require a service for removing thermoplastic road markings and are looking for an efficient and cost-effective process, contact us today to find out more.